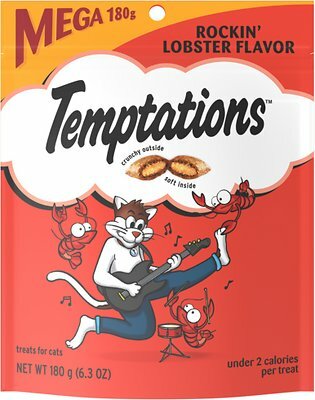 Tempt your kitty with the scrumptious taste and enticing texture of Temptations Rockin’ Lobster Flavor Cat Treats. 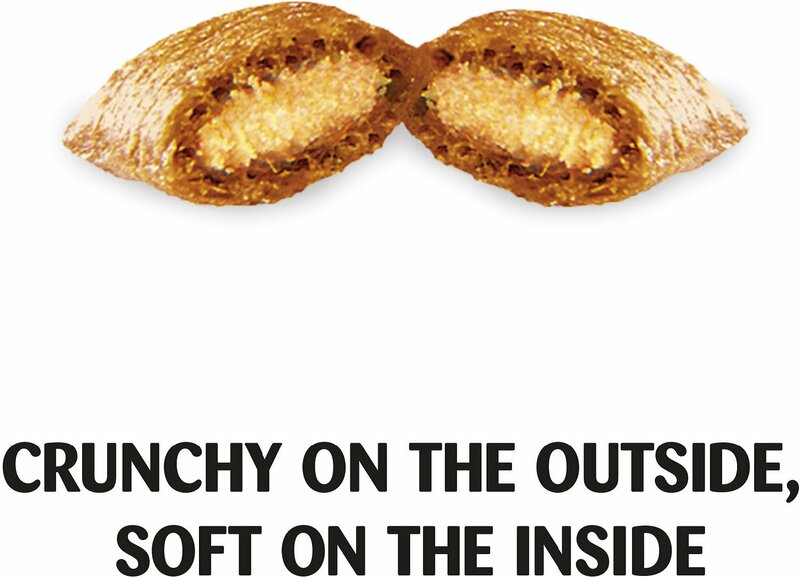 These unique little pocket-shaped rewards have an irresistible crunchy outside and a soft and creamy inside with a natural lobster flavor. 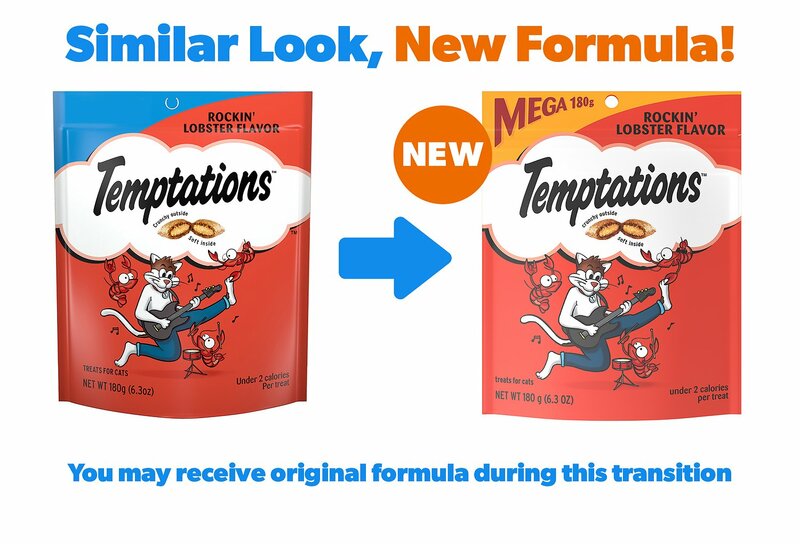 These Temptations treats are 100% nutritionally complete and balanced for adult cats and are just under two calories per piece. Shake the bag or tub to capture your cat’s attention and watch her run towards you with pure excitement, ready for next reward! 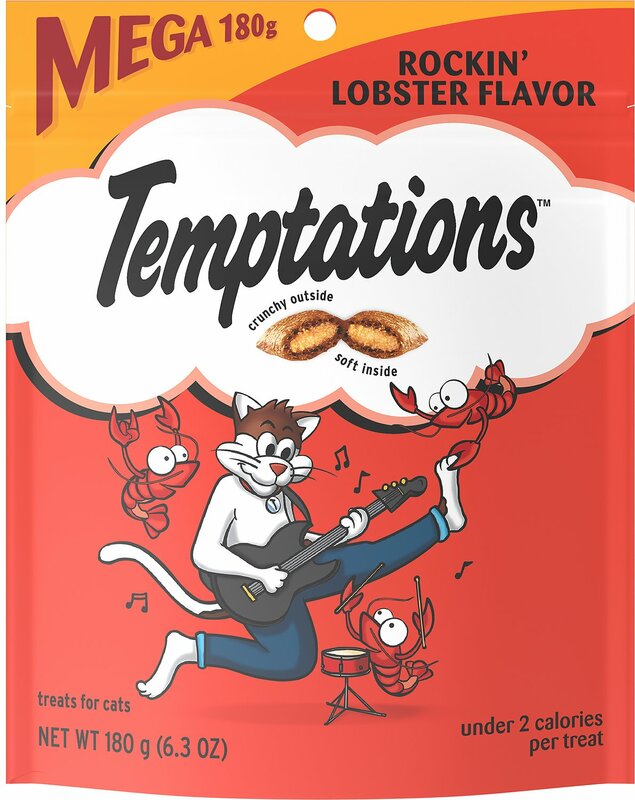 Made with a unique pocket shape and a lip-smacking lobster flavor that will have your pal purring for more. 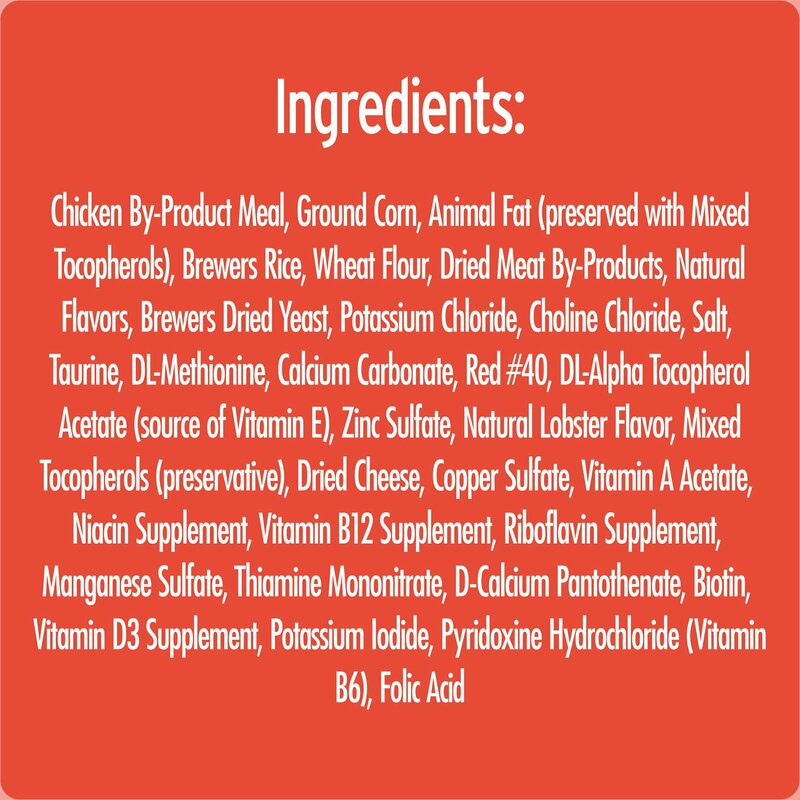 Chicken By-Product Meal, Ground Corn, Animal Fat (Preserved with Mixed Tocopherols), Dried Meat By-Products, Brewers Rice, Wheat Flour, Natural Flavors, Grain Distillers Dried Yeast, Potassium Chloride, Choline Chloride, Salt, Taurine, DL-Methionine, Calcium Carbonate, Red #40, Vitamins (dl-Alpha Tocopherol Acetate [Source of Vitamin E], Vitamin A Acetate, Niacin Supplement, Vitamin B12 Supplement, Riboflavin Supplement, Thiamine Mononitrate, d-Calcium Pantothenate, Biotin, Vitamin D3 Supplement, Pyridoxine Hydrochloride [Vitamin B6], Folic Acid), Minerals (Zinc Sulfate, Copper Sulfate, Manganese Sulfate, Potassium Iodide), Natural Lobster Flavor, Mixed Tocopherols (Preservative), Dried Cheese. Feed 10-12 treats per 10 lbs of cat daily as a treat or snack. 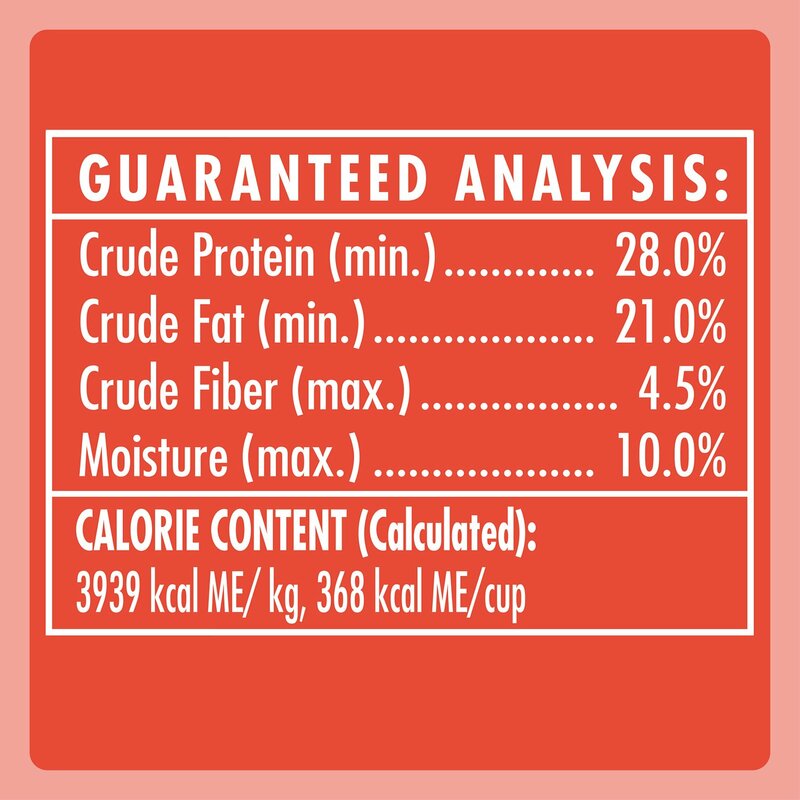 If fed as a main meal, feed 1/2 - 2/3 cup of Temptations Cat Treats per 10 lbs of adult cat daily. Provide fresh drinking water at all times. My Cat's Favorite Tasting Treat! Both of my cats are crazy over these treats. They loved the chicken ones too along with the "Mix Up" ones but as soon as they got a taste of the Rockin Lobster treats, that was all she wrote. I will be ordering more of these. Wish they came in a larger container or size like some of the other treats. We love Chewy for our pets needs and would not deal with anyone else because of the customer service we have enjoyed over the last several years with them. My cat loves the lobster flavored treat. She does not stop begging for more. I will continue to purchase this item. You should too. Delivery is quick. That is why I choose chewy to do all my cat treats. I always have a spare bag of this temptation brand new flavor. Don't miss out. I am sure your cat would love it too. Oh my does my Dar love this flavor, he crawled his way up me to get to them. He is 17 years old. He has lost most of is appetite except for his yum,yums(temptations). He also lost the rest of his teeth last year. I crush each one in his bowl, so when he picks it up and it falls apart in his mouth. It took me some practice to give the exact pressure not over break it, but it’s the only way he can have his yum,yums. Please start carrying in tub form. All my cats have always loved this brand, but this flavor is a must. Sorry my cats did not like them at all. Had to throw them away. I have 3 cats and none of them liked them in fact my older cat threw up after eating them. They love all the other temptation cat treats! My cats love these; even the most finicky. I normally give my feline chicken, turkey , chicken-turkey- cheese treats, once in awhile a dairy or fish. I bought these to try + oh my they couldn't get enough! All of my cats Love Temptations, not all the same flavors. 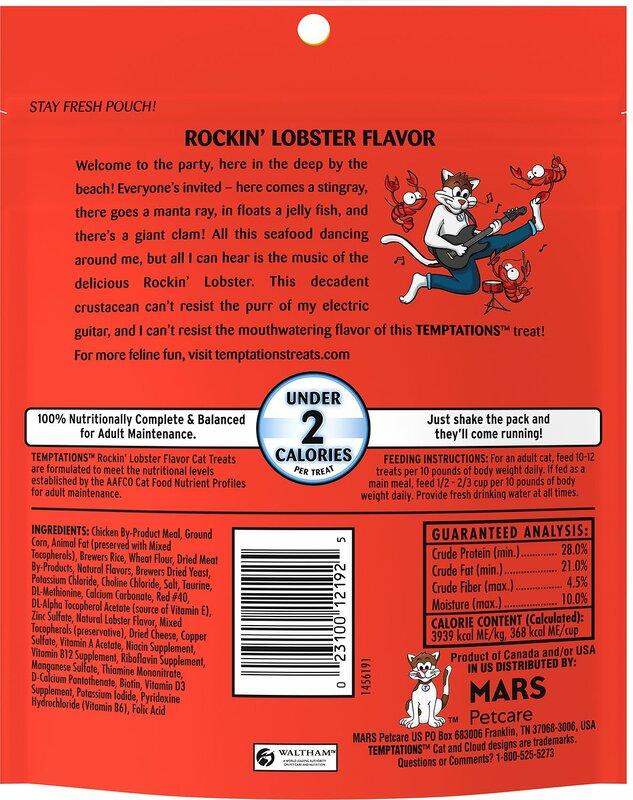 When I picked up the Lobster flavor I wondered who would like it. To my surprise all 15 cats Love them. They actually eat theirs as fast as they can so they can go steal someone else’s. My 4 cats love this new flavor. They were fighting each other so Had to hide the slowest eating cat so the other three would not eat all her treats. Hide them in a secured cabinet with security!